Fight to prevent a terrible demon from returning to Terrinoth in Treaty of Champions, an upcoming Hero and Monster Collection for Descent: Journeys in the Dark. 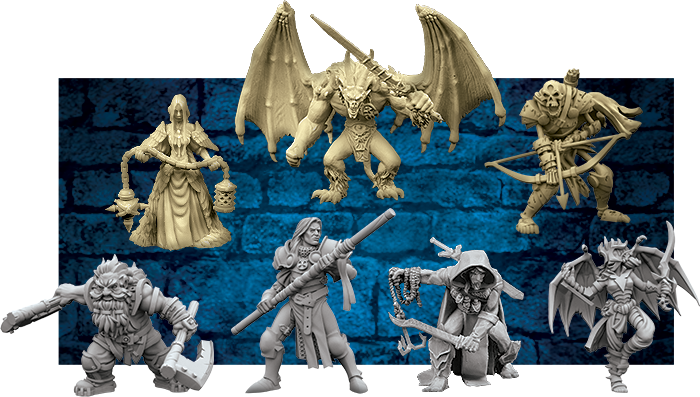 Like other Hero and Monster Collections, Treaty of Champions brings heroes and monsters from the first edition of Descent into the second edition with completely updated artwork and figure sculpts. In addition to these updated heroes and monsters, two brand-new quests and an entirely new monster group add new dimensions to any Descent campaign! Today, we’ll preview one of the brave heroes and a sinister monster group included in Treaty of Champions: Grey Ker and the skeleton archers. A hungry childhood on the streets taught Grey Ker that even the most despicable wretch might be kind to children and a priest might steal from the poor. In adulthood, he lives by a simple code: justice is forged, not found. However, the justice that he employs is often beyond the scope of the transgression, causing many, even his own brother, to denounce his deeds. Regardless, there are many who still work alongside Grey Ker, a man of undeniable results. Scouts in Descent are commonly some of the most versatile heroes, able to fill multiple roles in the hero party, but even among Scouts, Grey Ker is remarkable for his simple flexibility. 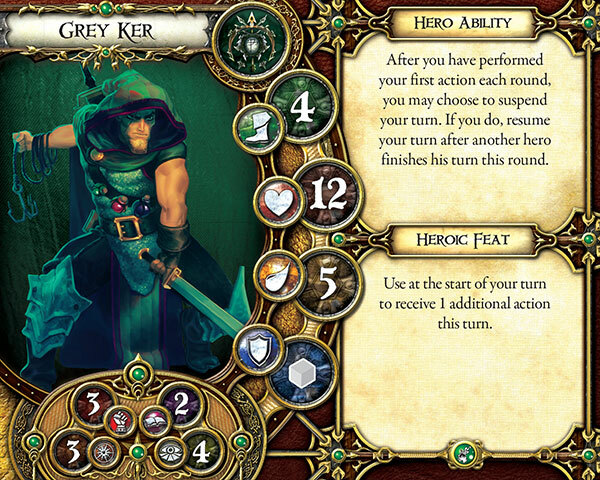 First, Grey Ker’s hero ability allows you to suspend your turn after you perform your first action each round. Then, you may resume your turn after another hero finishes his activation, taking your final action at that time. This unique approach to actions allows Grey Ker to carefully time his actions for the maximum effect. For instance, you may open a door, then suspend your turn to allow another hero to enter and attack a powerful monster. Once you’ve seen how that attack resolves, you can decide if you want to finish off the wounded monster or use your remaining action to accomplish some more useful goal. Either way, waiting for the perfect moment to strike gives Grey Ker a distinct edge. Grey Ker’s heroic feat also increases his general flexibility for any situation. By triggering Grey Ker’s heroic feat at the start of his turn, he receives one additional action to use during the turn! Obviously, this can be useful if you need to accomplish more in a single turn, but when used in conjunction with Grey Ker’s hero ability, this heroic feat allows you to suspend your turn after your first action and still have two actions when you choose to resume your turn. Between his heroic feat and his hero ability, Grey Ker is undoubtedly one of the most adaptable heroes in Descent. Few creatures enjoy the flow of blood from punctured flesh more than skeleton archers. These undead warriors fight until their bones splinter and their skulls collapse under the blows of their enemies. Terrible magic gives them shape and years of battle perfect their skill. Standing together, they form an unstoppable tide of iron, bone, and death. 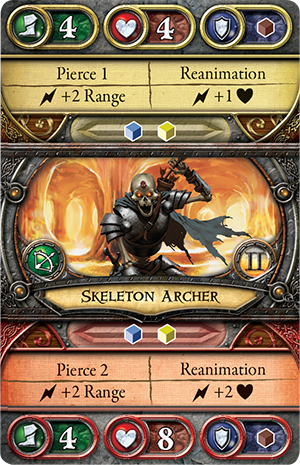 Skeleton archers serve a very useful role within the overlord player’s armies of monsters. These undead creatures are too weak to trade blows with the strongest heroes, but fortunately, they don’t need to. Skeleton archers excel at staying out of the heroes’ way, sniping with arrows and wearing them down so more powerful monsters can quickly defeat the beleaguered heroes. Skeleton archers can spend surges to deal additional damage or increase their range, but even better, their attacks naturally pierce the heroes’ armor—you don’t even need to spend a surge to trigger this effect! 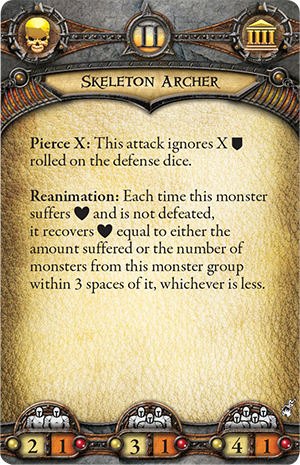 What’s more, skeleton archers can prove quite tough because of the Reanimation ability. Whenever a skeleton archer takes damage and isn’t defeated, it recovers damage equal to the amount suffered or the number of skeleton archers within three spaces, whichever is less. Reanimation may even completely negate some attacks, especially if your skeleton archers stand and fire from a single unified cohort. 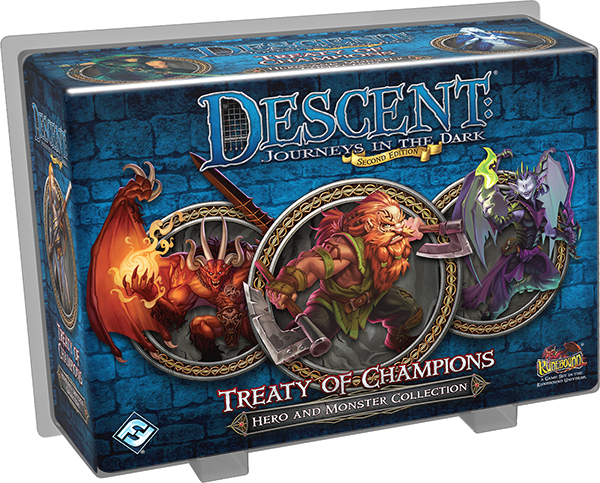 With two new quests, an entirely new monster group, and a host of heroes and monsters from the first edition of Descent, Treaty of Champions offers new dangers and new thrills for every Descent campaign. Look for Treaty of Champions at your local retailer soon!